The team standing on the large concrete apron that sits in front of the bridge. 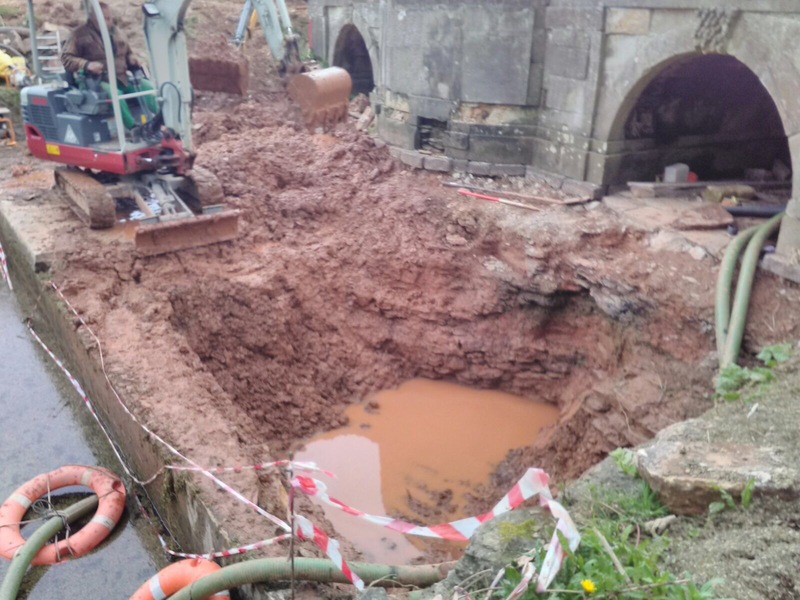 While much of the damaged and missing stone is being carved for the restoration of the bridge, the dam works have also been started so that the foundations and leaks are made good before the bridge structure itself is put back to its original glory. Before work began the water level in the pond in front of the bridge did not rise to the level of the arches, where the water should flow out to create a waterfall behind. Instead it was seeping out and under the dam, potentially causing catastrophic damage to the foundations. Only during flood conditions did the water rise high enough, and then too high, creating dangers to the whole of the bridge structure itself. The concrete apron we were sure was added in the 1970’s when Mr Nataro owned the field and completed a lot of works which no doubt helped the landscape survive until the restorations could be taken up once more. What lay under this concrete apron was a mystery. Was the concrete covering an older similar in-fill that was necessary to create the dam and support the stone bridge? Or was it entirely constructed in the 1970’s and not part of the original engineering? Was it superfluous or necessary to keep the dam from crumbling and being washed down stream? Diggers large and small put into action to understand the archaeology. 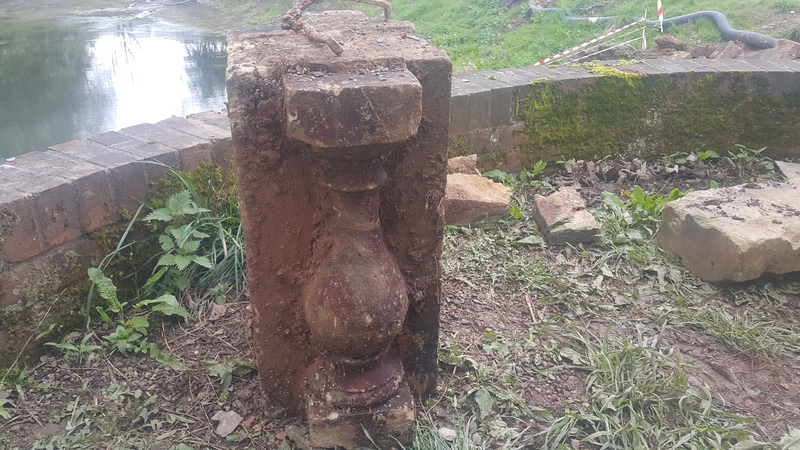 The only way to find out was to remove the broken and leaking concrete, both to locate the weaknesses and to restore the original form, if that proved possible. The condition of the above-ground bridge structure, though propped up and secured from both sides, was still highly delicate and the works needed to proceed with the greatest care to avoid unnecessary shocks and vibrations. With the first third of the material removed the original foundations of the above-ground bridge became clear; as did a rough-stone south wall that pre-dated the 1970’s concrete apron which was built alongside and on over its top. 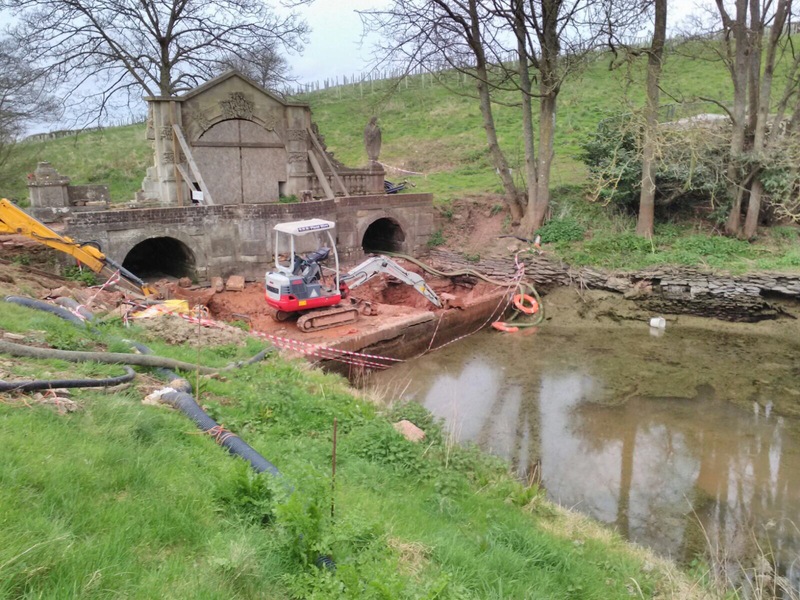 The pond being emptied for the safety of the dam works as well to prepare the area for de-silting and bank wall repair works. The 1970’s concrete, puddling clay from various dates and miscellaneous in-fill materials removed. The original pond drainage channel found! The wall section directly above it has been re-built at some point, one of the many historic changes that we have discovered during the first week of exploration works. We hoped that the dig might give us new insights into the dam and the structural stability of its foundations, this we got in spades. 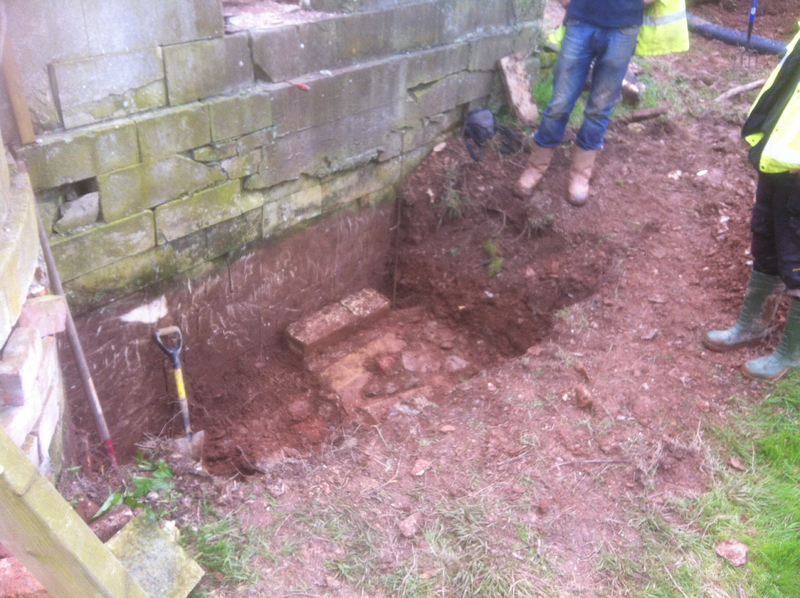 We discovered the original low-level drainage channel which is damaged but still allows some water to flow through. 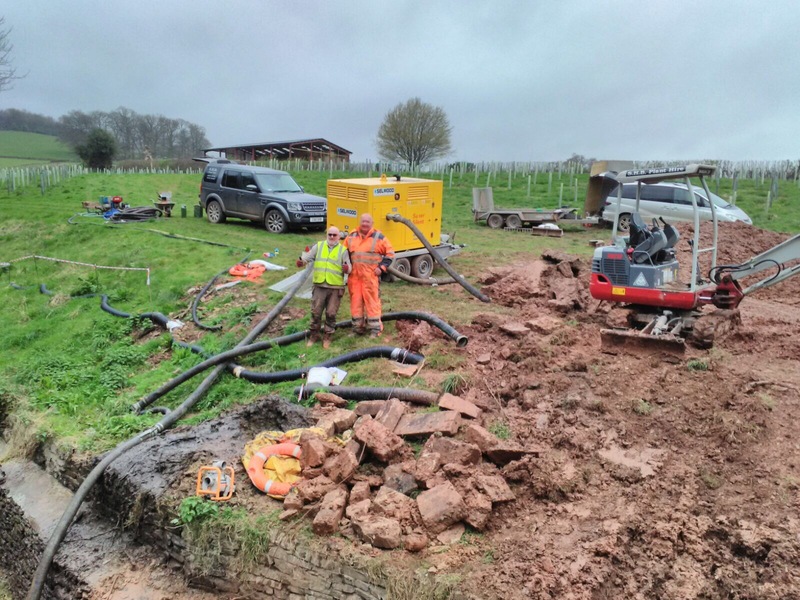 Our structural engineer, Jon Mann of Mann Williams, has confirmed the original dam foundations are sound, which is much better news than we had expected. Under the concrete layer we removed all the old puddling clay and other materials so that it could be sifted through for archaeological finds before structural repairs were to begin. 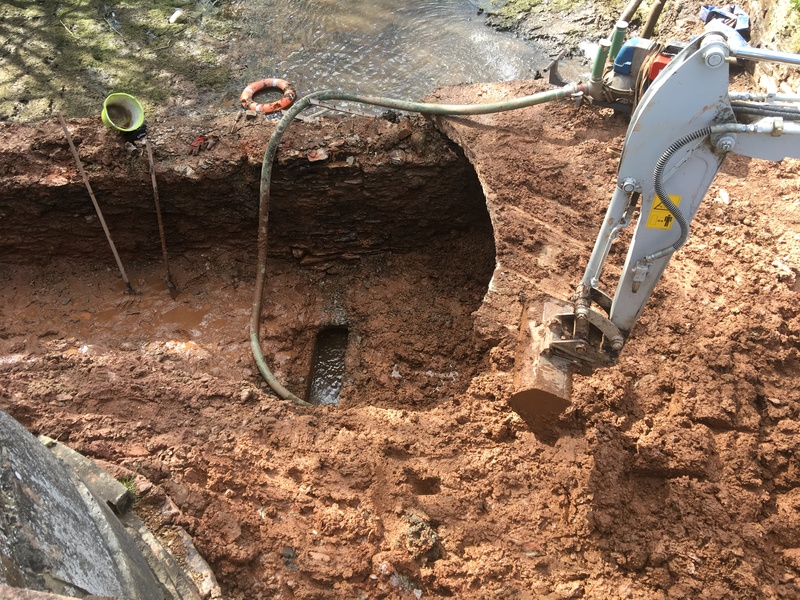 These will include repairing and sealing the lower level drain, making the upper level waterproof and reinstating the puddling clay barrier. The high 1970’s wall will be removed and the earlier rough-stone wall will be retained to act as it had done before, as a footing for the deep layer of puddling clay desirable for the safe maintenance of the dam. What we had not dared to hope for was new information about the above-ground bridge but new finds kept coming out of the ground in the form of fallen cut stone; much of which is missing from the eighteenth-century structure. At the time of writing there are only two known images of the bridge between 1753 and the 1970’s. 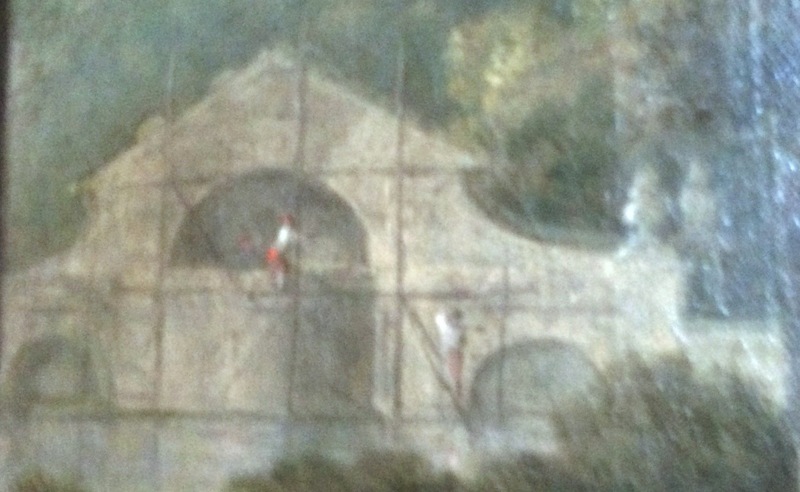 This is a detail in a portrait by William Hogarth which was painted two years before the bridge was completed in 1755 and a photograph given to us by Mrs. Gill Durman dated 1950. William Hogarth, c. 1753, a detail from his portrait of Sir Charles Kemeys Tynte. 1950, image courtesy of Mrs Gill Durman. Sadly the Term figure on the left side was removed from the listed bridge by a previous owner of Mill Wood and has been lost. A lot can happen to a structure such as this over 200 years. Because of the damage done before that photograph was taken, whatever constituted the north side of the bridge could only be guessed. The broken stone from just above ground-level is clear in Gill’s photo, as it some of the newly fallen stone below the bridge. Was it a balustrade to match the blind one on the existing side, or just a low coping stone? Or as Mark Lidster of Corbel identified in the Hogarth painting, it seems that it was originally intended to have a pair of sculptures at either end and what seems to be two full height walls, presumably topped with a roof at the centre. From the stone found so far it appears that the bridge was not built to these early thoughts but with the one, south, wall that still mostly stands. 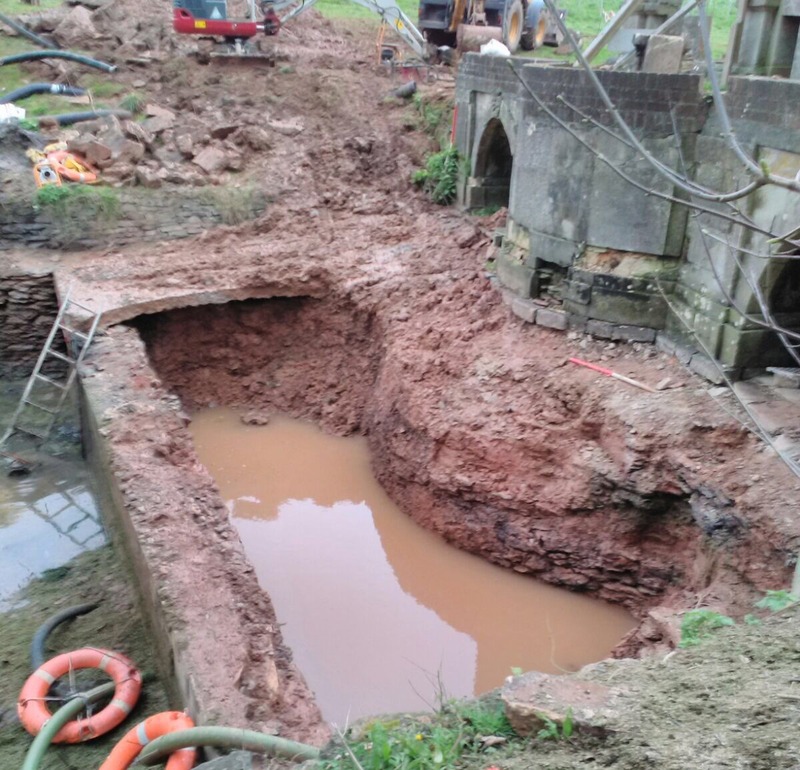 But very excitingly what we have found in the silt seems to confirm that there was a balustrade on the north side, mirroring the blind balustrade that partly exists on the north wall. 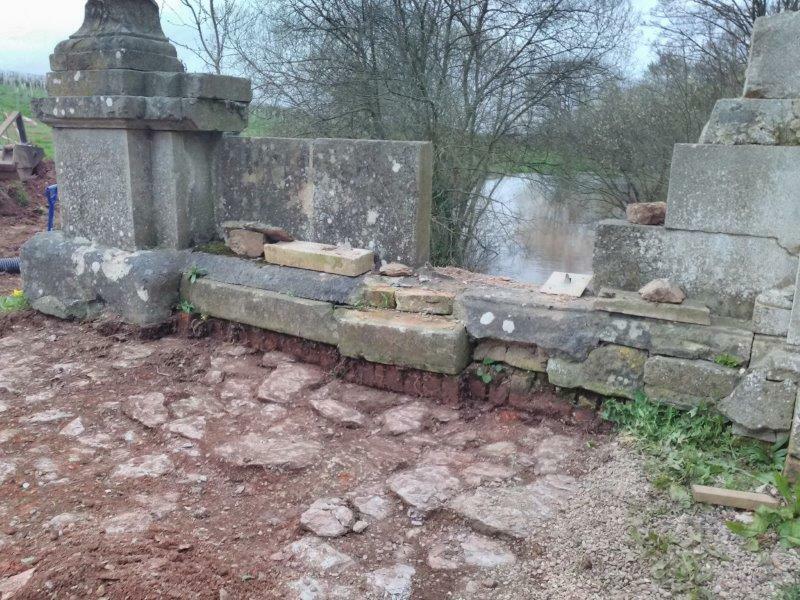 This physical confirmation should now allow us to rebuild the original north balustrade once we have discussed our new findings with Historic England. Chris Stones and Simon Bowditch with some of the huge quantity of original bridge stone found under the archaeological watch of James L. Brigers, this is being sorted and catalogued for re-inclusion where possible in the bridge restoration. 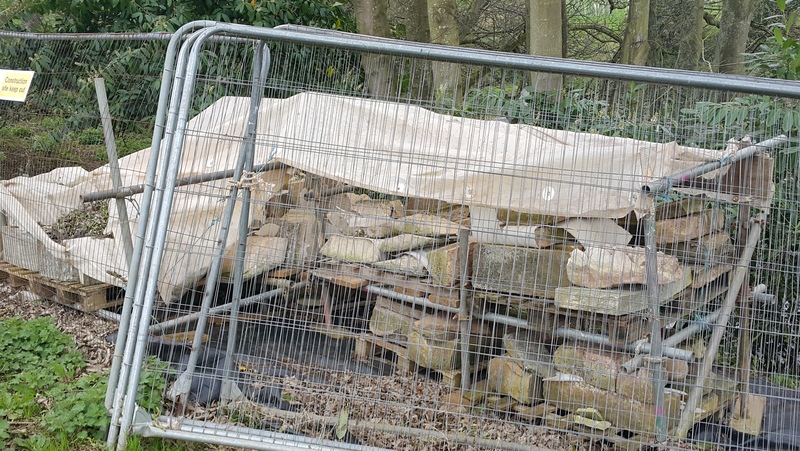 Added to this collection of found stone that we had already complied a great deal of original material can now be re-incorporated into the fully restored bridge. A stone pillar with half-balustrades at either side, found beneath the concrete layer. The red brick wall behind in 1970’s work added to the bridge where this type of stone balustrade was originally sited. 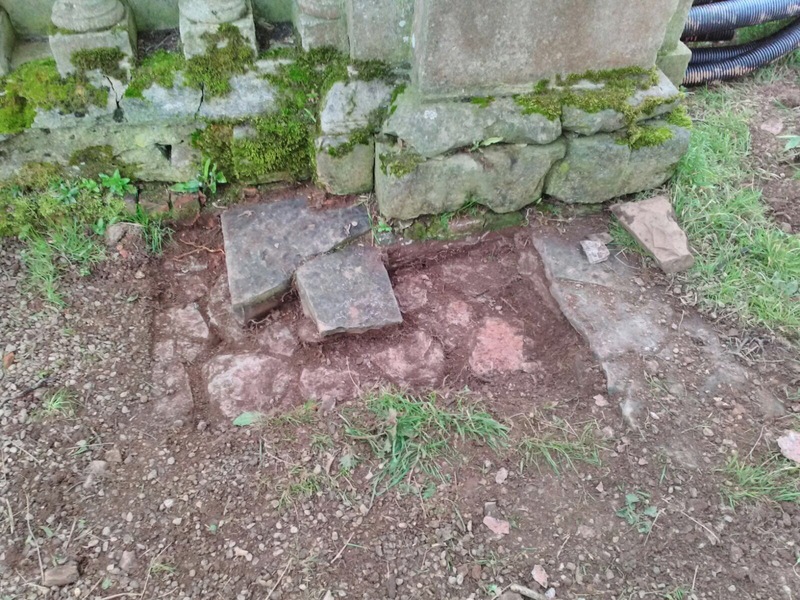 The earth level on the bridge was also removed by archaeologist James Brigers who has identified the original flooring. This appears to be a mixture of redbrick and blue lias flagstones – presumably taken up after 1950. Behind the bridge we unexpectedly found that the cut stone wall and apse continued below what is today’s ground level. This is a clear indication that the earth bank has been built up on this side, reducing the apparent size of the structure from this view. 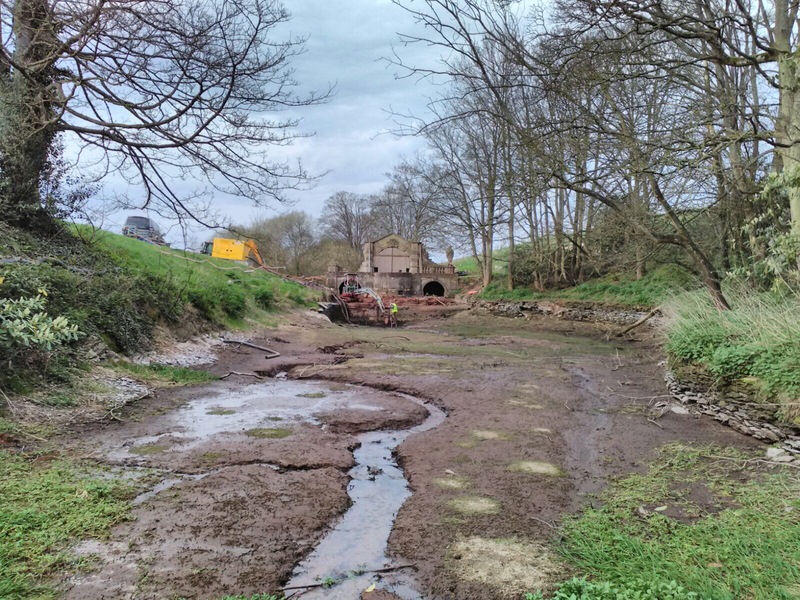 Inside the new trench is a blocked-up water culvert which originally took water out from the western arch and channelled it to an overhanging stone water flow into the next pond. 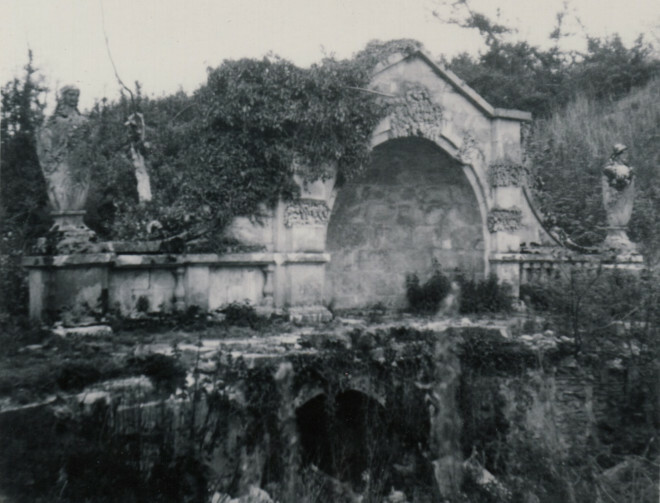 The east archway still has its outflow in working order but it seems James Brigers believes this outflow was filled-in in the eighteenth-century resulting in only one archway allowing water through it from a very early period. 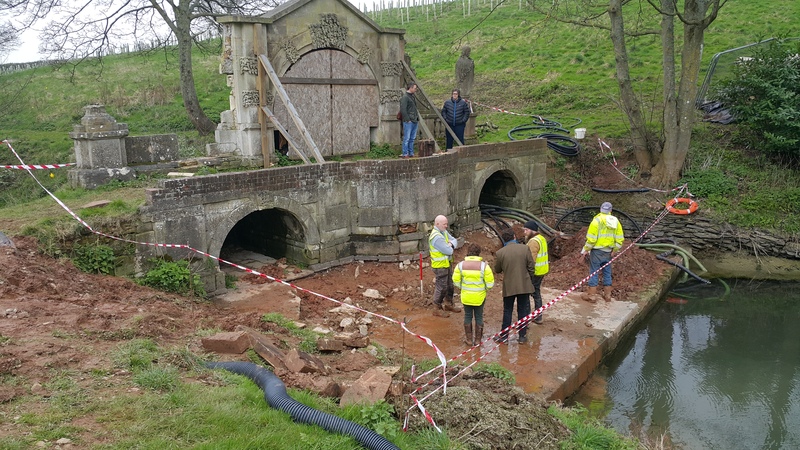 The architectural treasures within the archaeology will hopefully help us decipher the meaning of the bridge’s idiosyncratic decorations and by so doing help to resurrect the meanings hidden within this eighteenth-century landscape. Wow – just wow – it’s fantastic to see all this coming back to life!